The Deep South is not the place you usually think of when a discussion of haunted attractions breaks out. But in recent years a number of major events have begun to gain recognition in the haunt community, events far from the autumn leaves and cool October nights of the eastern seaboard and Midwest. 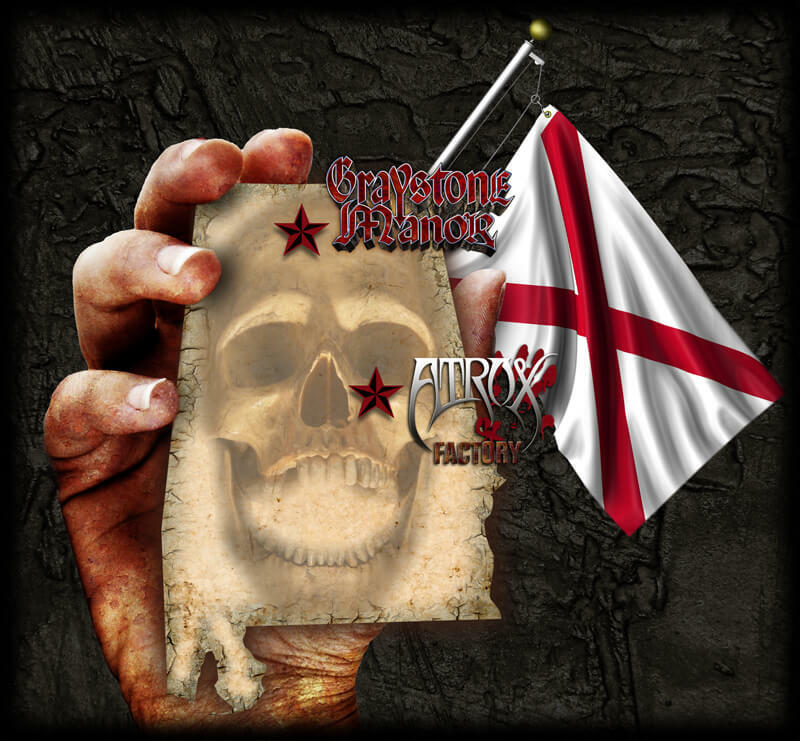 Today’s excursion will take us to Alabama for two major haunts that share a close connection even though they are both very unique events: Atrox Factory and Graystone Manor. The story of Atrox Factory goes back many years to a group of friends and a haunt called Slain Manor. Slain Manor was a small show in a creepy farmhouse far off the beaten path near Birmingham, Alabama. Over a number of years they grew it into a sensation with huge crowds and long waits, but after a successful run the place was no longer available. The core group of haunters then took a year off and traveled all over the southeast seeing what passed for haunted attractions in other markets. Invigorated by the trip they decided to create a monster of an event and turn the local haunt scene upside down. Thus Atrox was born! ATROX: The Very Name means Horror! Securing a vast building in Leeds, Alabama just outside of Birmingham they were faced with a huge challenge. In Slain Manor every square inch mattered, now they had the opposite problem, to fill almost 50,000 square feet! The event would be massive and require a totally new approach. Key to the design was the memory of their old haunt and the long wait that the crowds had to suffer through. Atrox would be designed from day one with a system to organize and entertain the huge crowds that would soon descend on the place, a system that used a large part of the building not as a queue line but as an arena full of entertainment options. Taking the Latin name for horror they began the process of building Atrox Factory! For years I had heard tales of the event, just a few hours away from our own, and one dark night I finally got to see it. We jumped in a car, tired from a day of building our own show, and made the drive to Alabama. We were treated to an expansive tour by Paul Johnson the “Main Slain” and his crew, truly a heaping helping of southern hospitality. So what was it like? It was huge, very organized and very different from almost any haunts I have seen. The first thing that you encounter when you enter is the arena. Visitors to Atrox in the past could enter this room free of charge and then head over to the “ticket booth”. Now entering this room has a cost, and even getting in the arena is something guests must wait a good while for. The ticket booth doesn’t sell tickets, but rather “tokens” representing assorted body parts. Visitors are then free to hang out in the arena until their token is called and about 100 of them enter a short chain linked queue line for admission to the Haunt. I think this is a really cool idea from a haunt management side because you are not giving a firm commitment to a certain time to enter, but rather to a sequence of admissions almost like standing in a queue line without doing so. Guests may buy food, go to the gift shop, watch horror movies or meet the often top tier horror celebrities Atrox brings in every weekend. Actual queue time once the token is called is short, but when the announcement is made “to enter the cage” the repressed terror often makes guests freak out and leave without entering! Although the event is large, it is the goal with this regulated timed entry concept to keep the groups separated as much as possible. The first room is a detailed study where the theme of Slain is revealed, and the guests enter into the catacombs via a secret door (There they encounter a Spookywoods Skeleton Costume totally camouflaged amongst the bodies!). The scenes that make up the show don’t necessarily stick to any one theme but rather are designed to explore the deepest fears of the audience. Early areas include an extensive surgery zone with a large industrial fan called the Gauntlet, a raised platform clown scene, and a tricked out execution area featuring a Shake-N- Bake by Distortions. Much of the haunt is left in near total darkness, with well placed drop panels, wall mounted mirrors or concealed animations with high quality sound shocking patrons in the dark voids between the larger more detailed sets. In an unusual contrast, much of the haunt has rails separating the audience from the sets, like such classic events as the Haunted Schoolhouse in Akron Ohio while other areas feature huge unrailed open format rooms like you might see at The Beast in Kansas City (notably the scarecrow room). Then some of the halls are tight with things set right in your face like they are in most haunts, in a design style that really keeps you guessing. Midway through the event you get to a very wide room with a series of shacks. There are many human sized animations here, and when the chainsaw attack occurs, it totally feels like the final scene. But you are only somewhere near the middle, followed up almost immediately by a huge gory butcher/blood splat room. 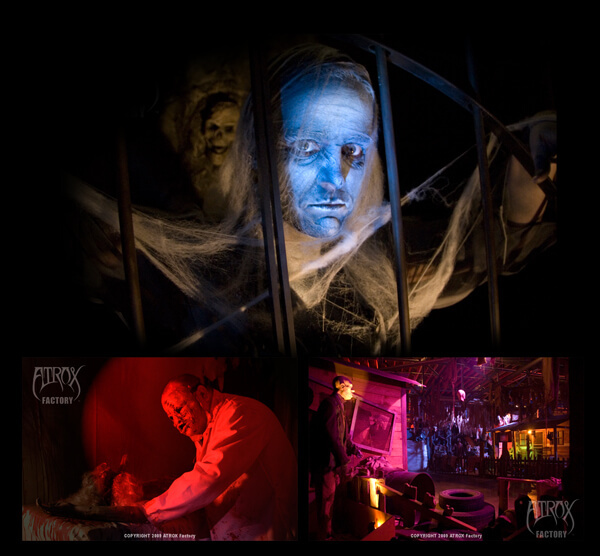 Many amazing events await guests on a journey through Atrox, as the scares just keep coming. In one section a HUGE truck rushes out of the darkness, driving a chain link fence to fall (seemingly) onto the crowd! In another, a creepy lab purported to be the site of real paranormal activity, a very small actor rushes from under a table shocking the guests out of their shoes. One area is located in an old storage section of the building where they have cut a path through massive shelving units. The place is submerged in spider webs and fog creating an extremely eerie environment. The place is full of quality props and animations from vendors such as Unit 70 including a massive Yuggoth monster and Distortions with Tortured, Rage and the Body Saw illusion. They also make use of the Oak Island claustrophobia tunnels and shock pads plus the ever popular Vortex Tunnel. Some of my favorite features were the cold sticky latex they coated many walls with and the custom built rocking floor, an entire section that shifted with the weight of passing customers. Other popular scenes at Atrox included a very effective distraction/plex bang and a maze with sliding walls. In the old days they would confuse and trap people for long periods of time, but now this is done less and less as attendance has grown. Another area that Atrox really shines in is the insane backstage area. Actors have a large comfortable costume/makeup room with a time clock and a big screen TV along with several airbrush stations. Actors also have a unique system in the haunt of getting help when they need it. Every major scene has a special panic box with buttons, one for medical, one for security, one for tech and one for a “monster mom” This sends a signal to the control room (where the cameras positioned all over the show are monitored), so that the proper help can be dispatched as needed. The workshop is huge, with every major tool and supply ready to build scenes all laid out for use, and the backstage areas have massive corridors that rival the behind the scenes areas of the late Rocky Point. The entire operation is well organized and neat, not what you would expect from a bunch of haunters! Due to the high volume of celebrities that visit Atrox they have a well appointed green room and a special stage for these visitors. Their use of celebrities is a story in itself, and is one of the many things that Atrox is known for. The entire impression of Atrox is one of massive scale and organization. The way that the flow is controlled, the use of actor call systems, the large backstage areas and the variety of technology based scares (crisp audio, big gags) speaks to immense amounts of planning. I don’t think that I have seen a show this tightly organized since Rocky Point. Truly a stunning spectacle of fright awaits those who would dare explore its cavernous depths! Any of you who have spent much time on the Hauntworld forums have heard of the irrepressible Shane Dabbs. Coming into the haunt scene like a fireball a few years ago, he was well known for sharing his opinions, but his event, Graystone Manor located in upstate Alabama in the small town of Killen remained an enigma. As it happens my wife’s family is from the Shoals area, less than an hour from Shane’s haunt, so over the Christmas holidays I popped over to meet the man and see the show that at the time was shrouded in mystery. I was very pleasantly surprised! The event, located in an old flea market, was massive, extremely detailed, full of props and animations, and getting the kind of attendance in just three years that many haunts never see. So where did this totally unexpected and out of place event come from? Shane had actually been doing haunts for many years, often with his friend Vinny Grosso, more of the typical set ‘em up and tear ‘em down type operations. Shane’s background was in Christmas displays and costume stores, so he had always had a connection to the holiday market, especially the Santa photo business that he had set up in malls all over the southeast. Another interesting part of his background was his collection of wild animals including big cats and snakes. In some of his earlier haunts animal actors were utilized to good effect, but he was always careful to obey all of the laws regarding their proper care. A few years ago an old flea market became available so Shane stepped in, not quite realizing the amount of time and money it would take to turn it into a successful haunt. The property contains a series of long shed like buildings that were once used for the tenants of the market to display their wares. This allows a ton of space for the haunt, but with limited width and ceiling height. The fire marshal insisted the buildings used for the show must be sprinkled, but Shane for the sake of realism wanted to actually have ceilings on all the haunt scenes, thus he was required to DOUBLE sprinkle the buildings, one set in the eaves and another under the drop ceilings, for an initial cost of over $90,000! A big influence on Graystone Manor was his good friend Paul Johnson and Atrox so he would also design an arena style queuing area as well as taking many inspirations from that haunt into the feel of his show. But in the end they would still be very different events, despite their common origins. When one arrives at Graystone you are greeted by a two to three story impressive façade of an old mansion with a backlit circular window that was custom built to span several of the buildings. You enter into a huge sanctioned queue room where tickets (tokens like Atrox) are purchased, then funneled into an indoor/outdoor waiting area similar to Atrox’s arena. Here guests remain until their group’s admission to the Manor, and many of them pass the time by eating! A huge well equipped fast food kitchen is set up with corn dogs, popcorn, cotton candy and every other imaginable fair food option you might want to indulge in. Entertainment is provided on several big screen TVs, a DJ and the house band the Cornstalkers who have a stage and seating all to themselves. The tokens bear symbols such as snakes or spiders, and when the creature is called one hundred or so guests queue up for their trip into the Manor. The first room is very similar to Atrox in which the story of the crazed Graystone is revealed along with a few other gags (Like dropping maggots!). Then the group is off into an adventure that I would describe as rolling out in four different sections. Unlike Atrox, Graystone is very tightly themed, and the entire feel of the place is different. While Atrox varies from tight to very huge open areas, Graystone has a very consistent realistic feel almost like you really are in a house. The drop ceilings, rectangular rooms and floor treatments (rugs) really create a sense of place. The walls are aged with paint washes and full of knick knacks like paintings and chair rail. I was especially impressed by a large collection of old bottles in one of the doctor’s office areas. In an interesting twist, windows in the house look into a secret hallway where actors can watch the guests go through the show. This hallway is also used to create a lighting storm with flashing lights and booming audio! The first section is the house and hospital/morgue area of the crazed doctor. A series of rooms like bedrooms, dining rooms, living rooms, trophy rooms, kid rooms, etc. gives way to examining rooms, labs, morgues, and other medical themed areas. The scenes are very populated with human sized animations primarily from Unit 70, featuring mutilations and insane gory patients twitching and popping up. Needless to say the gore factor is pretty high! Also fitting into the mix are very creepy old medical equipment and carefully concealed actor hiding places. After a fairly long series of rooms that might be an entire haunted house in other parts of the country, guests venture out into the outside courtyard between two of the buildings into the second “section” to experience a simulated thunderstorm! You cross a tin roofed boardwalk with rain pounding down on it over a “lake”. Flashes of lightning illuminate the lake and you see endless mounds of bones just below its surface! Shane has purchased truckloads of cow bones from a slaughter house and the quantity is amazing. Leaving the courtyard you travel down a long claustrophobic tunnel into the third “section,” a dungeon crypt styled area. Several larger animations are found here like a Scarefactory wolf and a Distortions Tortured animation. This section has stone like walls, dungeon and crypt like scenes filled with gruesome animations and even more massive piles of bones. The claustrophobia feeling grows here as many of the ceilings are arched with drippy set dressing hanging down, totally selling the illusion of an underground environment. After a large variety of related themed rooms you get to a very well done almost Frankenstein like lab with a cool custom built machine. Then it is out to the final section, an outdoor graveyard with standing mausoleums and the ultimate chainsaw area! This entire event is very tightly themed and extremely well decorated. The care to make arched ceilings and the elaborate custom lab set shows a serious degree of art direction, not to mention the massive façade at the beginning! I could not believe that a show only three years old in an area so far from huge cities could have this many effects and so many people coming to it. Shane has purchased dozens and dozens of gory animations, and has thrown in a black out maze and claustrophobia tunnel to boot. If this is Graystone in its first few years I cannot imagine what it will be like in the next ten! I can tell you all that Shane has a totally awesome haunt and it is only the beginning for him and his crew. Both of these events are exceptional, vast shows built in permanent locations, well funded, well attended, packed with the latest gags, with elaborate queuing systems and waiting line entertainment. Both are neat, organized and ready to scare the fool out of anyone daring to make the journey to see them. I don’t know exactly what I was expecting to see when I went to these haunts but I left both very impressed and eager to spread the word about how elaborate they were. The south may not be packed with haunts, but when they do spring up watch out! We may not have the crisp autumn evenings and traditions of the east and midwest, but when it comes to major haunts the South has definitely risen from the grave!